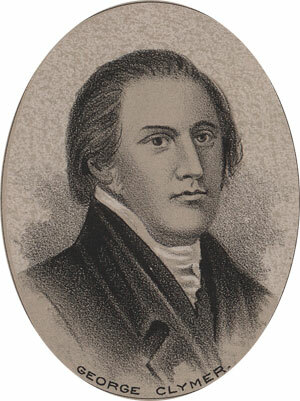 George Clymer, an orphan at an early age, was reared by a paternal uncle, who gave him a good education. He apprenticed in his uncle's counting room to prepare for a mercantile profession. He was a patriot partisan and leader in the disturbances in Philadelphia resulting from the Tea Act and the Stamp Act, and a Member of the Philadelphia Council of Safety in 1773. He was elected to the Continental Congress in 1776 and served several years in such important committees as the Board of War and the Treasury Board. He played a large part, along with Robert Morris, in strengthening the authority of General Washington and improving the provisions of the Continental army. In 1781 he was a member of the Legislature of his native state. He returned to the Congress in 1788 under the new constitution where he supported the presidency of George Washington. He was a revenue officer in Pennsylvania during the Whisky Rebellion. His last national public duty was a mission to the Cherokees in 1796. In retirement he was elected first president of Philadelphia Bank, first president of the Philadelphia Academy of Fine Arts, and vice-president of the Philadelphia Agricultural Society. He held all of these posts until his death in January of 1813.